Malcolm [X] . . . preferred to illuminate the bitter calculus of oppression, one in which a people had been forced to hand over their right to self-defense, a right enshrined in Western law and morality and taken as essential to American citizenship, in return for the civil rights that they had been promised a century earlier. In this work by Brenna Youngblood, a nearly monochromatic black field is punctuated by intersecting white lines, forming an ‘X’ at the center. Engaging in the history of abstraction as well as photo-montage and collage, Youngblood weds vernacular modes of representation with the language of abstract painting. Upon closer look, this black painting, titled X, is in fact full of definition and color: small specks of red, blue, and yellow appear ready to burst through the topography of the black surface. A trained photographer, Youngblood uses her experiences behind the lens to explore the intersections between image, illusion, and objecthood, often building up the surfaces of her canvases. In this context, the equally precise and messy ‘X’ acts as a spatial element—its white incisions accentuating the black ground. It also functions as an ‘X’—both a letter and symbol of negation—as well as a reference, and perhaps homage, to Civil Rights leader Malcolm X.
I think of a line as a thing that involves certain possibilities. It acts as a contour and moves in relation to a shape; it also acts as something that divides space. . . . I hope that my painting has the impact of giving someone, as it did me, the feeling of his own totality, of his own separateness, of his own individuality, and at the same time his connection to others, who are also separate. 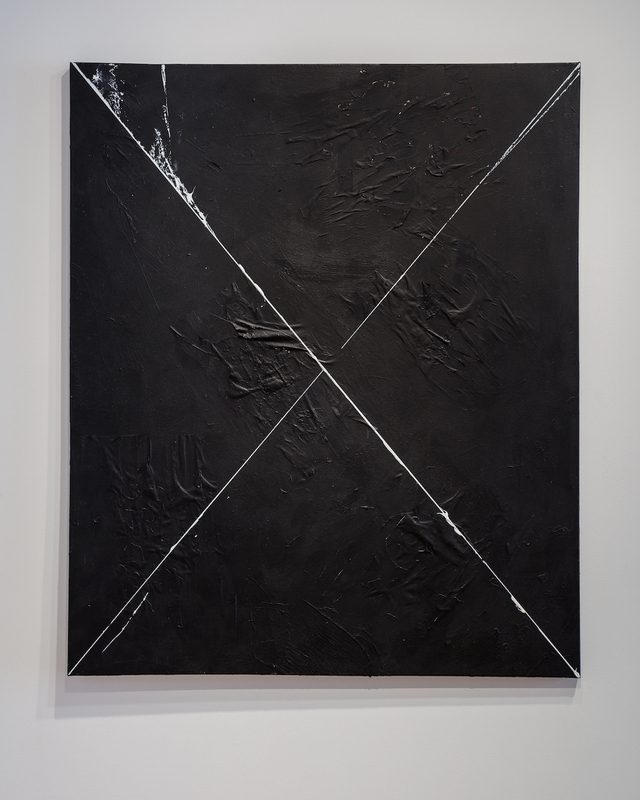 The New York School artist’s poetic interpretation adds even more meaning when thinking about the lines in Youngblood’s X—that the marks function, formally and emotionally, as both a dividing and uniting element in her work. With the title reference to Malcolm X, as well, the above message of possibility and hope takes on even more meaning in our current political climate—that despite our divisions, connection and unity is possible. Barnett Newman, Selected Writings and Interviews (New York: Alfred A. Knopf, 1990), 257.